Love the skirt and of course the WINE! 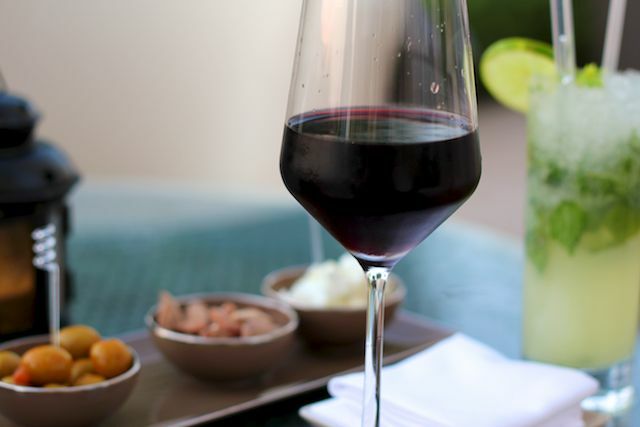 oooh, wine and tapas- I love that! I am obsessed with viognier in the summer and love pinot noir in the winter. Those sunglasses really finish your outfits- they really suit you! @metsis - I have every intention of dry cleaning :) this needs a professional! That's such a pretty skirt, really feminine and floaty and yet the black stops it from being ott girly. I love those pumps too! I drove from Dubai back to Abu Dhabi today and my goodness both places are so hot! Love's me some Red! My wine of choice is Chateauneuf-du-Pape. Yum. I actually quite like brown and black together. I'm wearing Particuliere on my toes right now too! Love the skirt. As for ironing. Let it drip dry on the washing and the pleats will stay in. That's what I do with my chiffon pleated trousers and skirts and all the pleats are still perfect! P.S. Loving ChocoVino Espresso lately. I love the skirt! 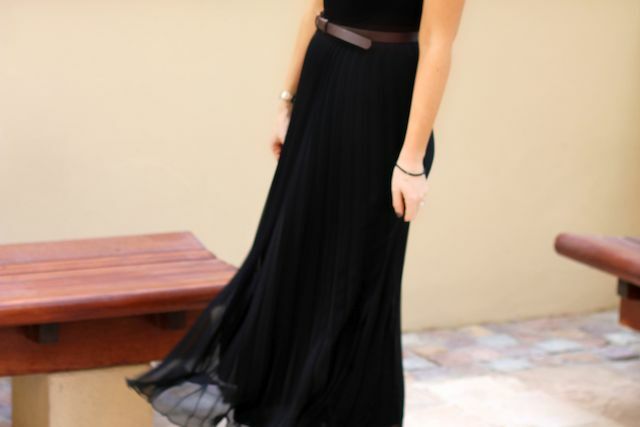 I'm not really a skirt person but I will be having a look for this,its really nice. Love the brown belt "with it breaks up the black, but thinking a gold skinny belt would look nice as well! I actually really like the brown belt with the outfit- you make it work! Oh, and I think the brown belt looks great with your outfit. The skirt looks amazing. I love your hair in this too. I loveee the skirt but want those flats!! Pretty! Perfect flowy dress for a breezy day =) I adora Laura! she said it would need no ironing that is! I actually think brown and black together, used in the right way, is really stylish and classic, particularly tan brown accessories with black. The skirt looks lovely and versatile, will look nice with just a plain grey jersey tee too. i love shiraz but prefer white; nothing compares to verdicchio or chablis. My favorite wine is sold everywhere in Iceland where I'm from but is unfortunately rare in the UK. It's from the Tommasi estate in Valpolicella Classico region of Italy. The red is the best one I tried, very light and fruity yet full-bodied. I miss not having it here! For medical reasons I cant drink red anymore :( big sad face. Used to love a good glass of pinot noir or montepulciano occasionally- lush! Gives me a fab excuse to have sparkling wine / chalamagne whenever a glass of wine is in order.. This is a great look. I think tan brown and black can look great together; it's certainly an interesting mix of neutral tones. I love neutrals of all shades mixed together creatively. I give it two thumbs for execution and style! love the skirt! Looks so good on you. I just re-discovered you! so excited. ohhh wine, mmmmmmmmmmm I'm a kiwi so really just stick to the New Zealand options (heaps) have you tried any? I am so glad to have found ur blog! I have always loved ur styleand personality! My favorite red is from california. Its a pinot called golden eye.